Intense public outrage is forcing the government to step up its fight against terrorism. Mohammad Hilal, 16, lies motionless on his bed in the Lady Reading Hospital in Peshawar. He is one of the survivors of the December 16 massacre at the Army Public School, which left 145 dead, including 132 children. Five young men give Hilal a firm handshake, placing flowers behind him on the windowsill. When the terrorists entered the school auditorium, more than 100 kids – mostly from grades 8, 9 and 10 – were taking part in a first aid training session. The seven gunmen entered the room shooting indiscriminately. Some of the children managed to stayed alive by pretending to be dead. Most were slaughtered. Four days after the massacre, and the air is somber. While schools throughout the country remained closed for security reasons, the Army Public School is filled with dozens of children, who have donned their school uniforms and are strolling through classrooms, which now have craters in the walls. Most of the blood-splattered floors have been cleaned but bloodstains and shattered glass are still visible. Photographs of some of the victims, taken from their Facebook pages or provided by relatives, are placed on wreathes and posters that adorn a large portion of the school grounds. The eerie silence in the school is in sharp contrast to the clamor in the rest of the country. In Islamabad, protests have been held outside the Red Mosque, whose chief cleric, Abdul Aziz, has refused to condemn the killings. Hundreds of protestors have shouted anti-Taliban slogans, holding placards of “Arrest Abdul Aziz.” The cleric’s obstinacy led marchers to lodge a police complaint (known in Pakistan as a First Information Report) against him on the second day of the protests. The public outrage has forced the government to respond. Two days after the brutal killings, Pakistan lifted the six-year moratorium on the death penalty. 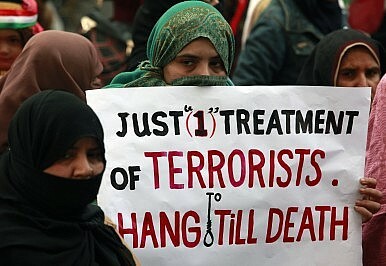 Convicted terrorists are now being executed, with six hanged already. In 2013, the Taliban warned that if the government executed Taliban serving jail terms, then the Taliban would be at war with the government. Nonetheless, the Pakistani government plans to execute 500 militants convicted on terrorism-related charges in the coming weeks, with the president having rejected their mercy petitions. Given the expected backlash, schools, airports and prisons have been put on high alert during the executions, with police and rangers deployed across the country. However, the desire for vengeance has spread beyond any single province. Throughout the country, people have been protesting on the streets and during vigils have held up placards that have demanded that the government hang the Taliban. Mina Sohail is a freelance journalist based in Islamabad. Pakistan: No More ‘Good Taliban’? Pakistan's government has vowed to end the Good Taliban/Bad Taliban distinction. Should we believe it?